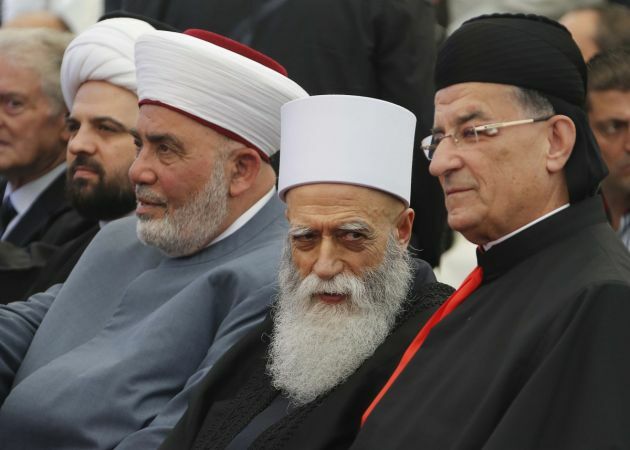 (Photo: REUTERS / Mohamed Azakir)Maronite Patriarch Beshara al-Rai (R) sits beside other religious clerics in a celebration to solidify the reconciliation between Christians and Druze in Brih May 17, 2014. Muslim officials in Lebanon have signed a petition organized by the Islamic Spiritual Summit condemning the continued assault on Christians in the Arab region. The petition states that the assault "constitutes a crime against humanity and a [crime] against religion and the nation." Mohammad al-Sammak, the secretary-general of the Islamic Spiritual Summit in Lebanon, which was signed by the country′s parliamentary Speaker Nabih Berri, former Prime Minister Fouad Siniora, Interior Minister Nouhad Machnouk and Sidon MP Bahia Hariri, alongside several other ministers and lawmakers, The Daily Star, Lebanon reported. Christians make up about 40 percent of Lebanon's 5.9 million people. The Islamic Spiritual Summit represents members from the Shiite, Sunni and Druze groups in Lebanon. The petition signed on September 5 called on religious figures, political heads, civil society, and the international community to cooperate to restore the lives of the displaced Christians. The exodus of Christians from their cities and villages is an "unjust aggression" that violates the "sanctity of their Churches," it said. Al-Sammak, a signatory in a 2007 letter addressing Christian leaders appealing for peace between Muslims and Christians, said Islamic groups should denounce the crimes as well as its perpetrators. He called on Arab governments to take "ethical and constitutional responsibility toward its citizens." The "citizens"are those who have joined the terrorist groups who neither acknowledge nor know the "sanctity of humanity and the holiness of religion." The Arab region is a versatile social fabric with various religions, such as Christianity, coexisting with Muslims. It is important therefore for civil society to press allied states to stop facilitating the exodus of the region's Christians, the petition noted. Sammak then appealed to both the Islamic Cooperation Council and the Arab League to cooperate with the United Nations and the Security Council to launch a joint international initiative to put an end to "the dangerous terrorist" threat.